Size of the INDUSTRY Today in India there are more than 350 Biotechnology companies in India providing employment for over 20,000 scientists. Government of India set up the Department of Biotechnology (DBT) under the Ministry of Science and Technology in 1986 with the aim of enhancing the Biotech Industry in India. Since then DBT has produced one of the best scientists of the country since its establishment. India has become the Hub of Biotechnology since the last decade and has become the main center of attraction for global investments due to the skilled and knowledgeable manpower available in India. Due to the rich resources available in the country, India has become one of the major areas for setting manufacturing units and Research laboratories by the MNC's. Success of Biotechnology industry in India was a difficult one in the early stages due to the long research period and limited funding. So the investors remained away from this industry for a long time period but once Biotech industry made its market presence, funds from investors flowed like rivers in this sector. In the next five years, biotechnology sector is expected for an investment of 7 to 8 billions which can result in a turnover of Rs. 9 to 10 billions. Biotechnology is a dynamic field which is inherited from various disciplines such as Biology, Biochemistry, Genetics, Cytology, Chemistry, Pharmacology, Bioinformatics and impacting important areas such as Medicine, Agriculture and environment. Bio pharma deals with the production of vaccines, therapeutics and diagnostics, while the end products of the biotech industry find two different kinds of buyers. Agri-biotech comprises of hybrid seeds and transgenic crops, biopesticides and biofertilizers. Bio informatics creates and maintains the extensive electronic databases on various biological systems. Bioservices market usually deals with clinical trial, contract research and manufacturing activities. Bio Industrial industry comprises of enzyme manufacturing and marketing companies and these enzymes are used in detergent, textile, food, leather, paper and pharmaceutical industry. In the year 2006 the global biotechnology industry stood at USD 73.12 billion, up by 15.49% compared to 2005. In 2007 the revenue of the Indian Biotechnology Industry reached INR 85.41 billion, up 30.98% from INR 65.21 billion in 2005-06. In, top Ten Indian Companies reported revenue of INR 37.74 billion in the year 2006-07. The Indian biotechnology sector is acquiring global visibility and the country is accounted for 2% of the $41 billion global biotech market. 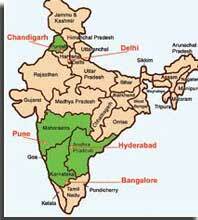 India in 2003 was ranked 3rd in the Asia-Pacific region and 11th in the world in the number of biotech enterprises. In 2004-5, the Indian biotech industry saw its revenues grow 37% to $1.1 billion. The Indian biotech sector has set a target of $5 billion in revenues by fiscal 2010-11. The Indian government's Department of Biotechnology conveys that annual sales could touch $25 billion by 2015. India's biotech business is on an upswing and has a formidable global presence. In terms of volume, it is ranked fourth in the world, while in terms of value of output it stands 13th. And it is the vast pool of skilled manpower and low costs that are drawing global biotech giants to partner with Indian companies. Among the Indian companies in the biotech sector two firms have exceeded 100 million dollars in revenue. There are more than 265 firms registered in India. The top ten companies capture 47% of the market. The top five companies were homegrown; Indian firms account for 62% of the biopharma sector and 52% of the industry as a whole. The Association of Biotechnology-Led Enterprises (ABLE) has aimed to grow the industry to $5 billion in revenues generated by 1 million employees by 2009. The International Finance Commission of the World Bank has granted $43 million to 4 projects in India out of the $110 million invested in 14 biotech projects globally. In today's advanced era, when people are exposed to so many physical disorders, Biotechnology plays a vital role in developing medicines, vaccines, energy production, and conservation. To keep pace with the competitive world, India has recently launched a comprehensive programme in biotechnology to make use of the resources available. In the year 1986 the Department of Biotechnology (DBT) was established under the ministry of Science and Technology. It is imperative that India has to keep up with the increasing demand for food from the ever expanding population. Agricultural land is also shrinking. Biotechnology can be used in a wide range of economic activity ranging from environment, animal husbandry, medicinal and aromatic plants, bio fuels, aquaculture and products like silk and leather. 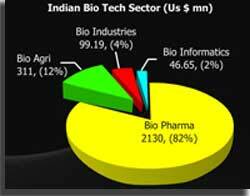 The Indian Biotechnology revenue is around Rs. 2960 crore, contributed by Biopharma (61%), Bioindustries (8%), Bioagri (4%), Bioinformatics (3%), Bioservices (19%) and Biosuppliers (5%). The biotechnology development which is led by the Biopharma sector, showing a growth of 38%, followed by Bioagri (63%) and Bioinformatics (6.7%) and Bioindustries (6.3%). The Indian biotech market is dominated by biopharmaceuticals; 75% of 2004-5 revenues came from biopharmaceuticals, which saw 30% growth. Today in India there are more than 350 Biotechnology companies in India providing employment for over 20,000 scientists. Most of the companies are located in the major cities of Delhi, Mumbai, Pune, Chennai, Bangalore, Hyderabad and Ahmadabad. The leading companies in India are Biocon, Serum Institute of India(in the biopharma space),MahycoMonsanto, Rasi seeds(in the agri-bio tech field),Strand Genomics, GVK Biosciences (in the bioinformatics arena),Syngene and Quintiles in the (in bio services). In the year 2008-09 Indian Biotechnology Industry's overall turnover was Rs 12,137 crore, said Ms Kiran Mazumdar Shaw, CMD of Biocon, and head of the Karnataka think-tank, the Vision Group on Biotechnology, citing the annual Biospectrum survey of industry. The revenue was Rs 10,273 crore in 2007-08. Opportunities in Biotechnology Industry in India have are great with many universities and other institutions offering B.Sc. 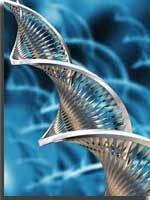 B.E., B.Tech courses in biotechnology. One can study Physics, Chemistry and Biology at the high school level to do graduation course in biotechnology. Post graduation can be done in biotechnology in special areas like Agricultural Biotechnology, Marine Biotechnology, Medical Biotechnology or Biomedical Engineering. Entry level jobs in the field of Biotechnology require a minimum graduation course. Those who have done PG courses can opt for research work starting as a junior researcher. The Career options in the Biotech Industry extend to medical schools, research laboratories, pharmaceutical manufacturing companies, chemical, agriculture and allied industries. Some of the best jobs exist in Research and Development as biotechnology is still a nascent science with tremendous scope for scientific research. The opportunities in biotechnology research include Scientist, Research Associate, Research Assistant, Bioinformatics Scientist/Engineer, Bioinformatics Analyst, Bioinformatics Programmer, Molecular Modeler, Facility Manager/Supervisor (Animal Sciences), Veterinarian, Lab Assistant, etc. India's biotech industry leading players comment says the field is positioned to more than double in size over the next five years as more companies in the subcontinent tap in on the potential for opportunities in clinical trials, manufacturing and more. Kiran Mazumdar-Shaw Bicon's Chief predicts that biotechnology will grow to a $5 billion business in the subcontinent by next year and then double to $10 billion by 2015. And she adds that the Biotechnology Industry in India has achieved a "critical mass" that has positioned biotech to achieve exponential growth. Indian Biotechnology Industry is highly research and development (R&D) intensive. Globally, about 37.9% of revenue is spent on finding and developing new products. The major Biotech companies today in India are spending considerable amounts on biotech R&D. Indian biotechnology sector is expected to become a five billion-dollar which is around Rs 23,400 crore Industry in the year 2010. A Report by the consultanting firm KPMG conveys that Indian biotechnology sector has excellent potential and is expected to touch five billion-dollar mark by 2010..
India is ranked among the top 12 Biotech destinations in the world and is the third biggest in Asia-Pacific in terms of the number of biotech companies. Investments in the segment are also growing at the rate of about 38 % for the last three years and have touched 560 million dollars in 2006-07. Biopharma is one of the important segments of the Indian biotechnology sector and it constitutes about 70 % of the domestic biotech industry. 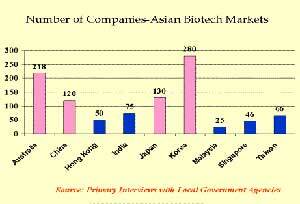 Out of total 325 biotechnology companies in India, more than 40 % are in the biopharma sector.